Anthem of the Seas, a member of Royal Caribbean’s Quantum-class offers cruise guests an action-packed traveling experience across a host of destinations worldwide. The Anthem of the Seas offers the whole family a cruise vacation full of endless fun, exciting entertainment, first-class gastronomy and the ultimate in relaxation. For the kids, the DreamWorks Experience, featuring favorites like Shrek, brings a world of fun while adults will find extraordinary entertainment amidst the backdrop of spectacular panoramic views at the Two70. Foodies can indulge their palate with delightful offerings from Jamie’s Italian and Wonderland Imaginative cuisine. Cruise the jewels of the Caribbean, Mexico and Bahamas on board the Anthem of the Seas. Kid-friendly activities bring a world of fun while adults will find extraordinary entertainment amidst the backdrop of spectacular panoramic. Foodies can indulge their palate with delightful offerings from Jamie’s Italian and Wonderland Imaginative cuisine. Cruise the jewels of the Caribbean, Mexico, and Bahamas on board the Anthem of the Seas. Cruise the Caribbean like never before onboard Royal Caribbean’s most revolutionary ship, the Anthem of the Seas. 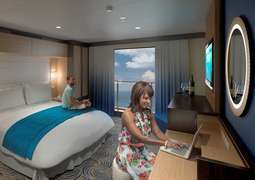 Staterooms on board feature modern design and the latest in innovation and technology. 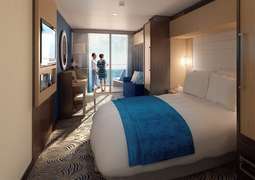 Expect more space, more comfort, upscale furnishings, contemporary art and incredible new features, such as the first at-sea virtual balconies for some Interior staterooms. 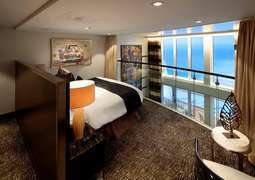 There is a variety of stateroom categories suitable for all cruisers from which to choose, including studio staterooms for singles, larger staterooms for families and all-new loft Suites for a truly luxurious experience. Anthem of the Seas features award-winning varied cuisine and flexible dining options with more than 15 onboard restaurants to choose from. Get adventurous at Wonderland Imaginative Cuisine, indulge in Moorish, hearty fare at Chops Grille American Steakhouse or visit the renowned Jamie’s Italian by celebrity chef Jamie Oliver. Thrilling, all-new entertainment innovations await you on board Anthem of the Seas. Cruise to new heights in the North Star observation capsule, experience the exhilaration of skydiving with the RipCord iFly simulator, go roller skating at the SeaPlex or hang ten on the FlowRider, the world’s first at-sea surf simulator. There’s plenty for the kids, too – the complimentary Adventure Ocean youth program, Royal Babies and Tots programs, H20 Zone kids’ water park and the Dreamworks Experience makes Anthem of the Seas fun for the whole family. Not only is Anthem of the Seas an adventure lovers’ paradise, but it’s also synonymous with relaxation. Experience the ultimate in rejuvenation at the Vitality Spa, unwind in the adults-only Solarium pool or take advantage of the ship’s state-of-the-art fitness center. For the more daring, there’s a 30-foot-high rock climbing wall that towers over the amphitheater – perfect to stay active on board your cruise. Strict dress codes do not apply on board the Anthem of the Seas. We recommend sporty, comfortable, casual clothing for daytime and advise you to adhere to dress appropriately for special evening programs. All guests under the age of 18 are considered minor when cruising on board the Anthem of the Seas. Both minors and guests under the age of 21 must be accompanied by an adult. The Anthem of the Seas is a Quantum-class vessel from Royal Caribbean. A marvel of maritime engineering, Anthem of the Seas, entered service in April 2015 and since then it has given many passengers the pleasure of traveling aboard its wonderful 1 passenger-accessible decks. A family-friendly ship is featuring numerous fun-filled onboard activities and top-class entertainment. Refuel, recharge and relax, the Anthem of the Seas is your escape from the fast pace and pressure of the city life. You can sail just about anywhere on this magnificent ship: Alaska, Canada, the Caribbean, Central America and other memorable destinations. 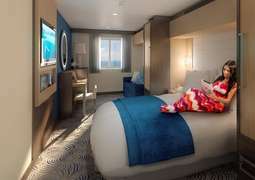 Like the other Quantum-class vessels, Anthem of the Seas is packed with the phenomenal onboard experiences including a 40-foot-long surf simulator, a rock climbing wall, ice-skating rink, mini golf and salsa classes, cantilevered whirlpools and much more. And of course, the ship offers a range of shops, lounges and cafés. For kids and families, Anthem has something for every day. Sit back and watch Broadways smash hit, Grease the Musical. Games, events and activities are going on all over the cruiser throughout the day making family time a great time at the sea. On Royal Caribbean marvelous Anthem of the Seas, your kids can sail with Madagascar, Shrek and the Kung Fu Panda characters. Go ahead, have the cruise holiday you have been wishing for. Innovations and limitless entertainment on the Anthem of the Seas. The Anthem of the Seas is one of the most modern cruisers in the world, it uses the latest and most innovative recreational activities to keep its guests entertained. Once onboard the Anthem, you will enjoy dining options that are rich in flavor and ambiance. Savour dish after dish of fine cuisine at the Main Dining Room and take your taste buds on a scrumptious culinary journey. For a French confection perfection with spectacular vistas, visit La Patisserie and take your sweet tooth on a journey. Izumi features innovative Asian-fusion dishes along with classic favorites. This Japanese spin-off is worth a visit and trying out its wide-ranging menu of salads, soups, fried rice and of course fresh-rolled sushi and sashimi. For a taste of variety, be sure to check out the intimate Coastal Kitchen with its Mediterranean delights. When you find yourself craving for something light, drop by Seven hearts and simply enjoy a snack while taking in the ocean views. In any case, this ship is a destination that exudes pure gastronomical adventure.